Due to the graphic nature of the fonts, uploading may take some time. This is a partial listing of the available typestyles. The individual font name is on the LEFT. The examples of selected letters written in that font are on the CENTER. The examples of words written in that font are on the RIGHT. 1. When looking at a font, be sure to note the style of both the uppercase and lowercase letters. Choose whether your lettering will be in all uppercase letters or upper & lowercase letters. 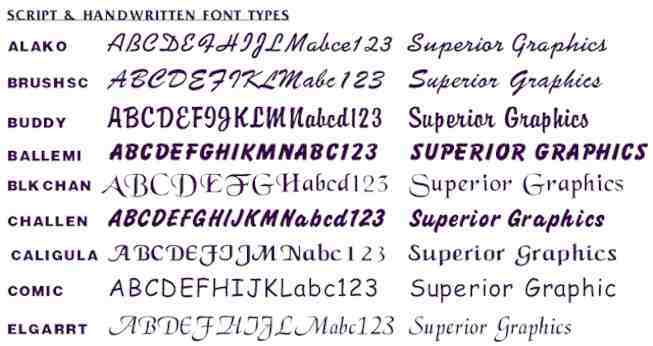 The Superior Graphics written to the RIGHT of the font gives you an example of how the font will look in upper & lowercase letters. 2. Most script fonts are better used with upper and lowercase letters.